Oh, how she loved that “burning” red two-piece bikini…but when they begged Betty to show it off, she couldn’t. 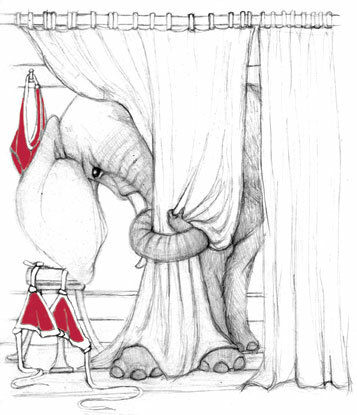 All she could do was shake behind the dressing room curtains…. Oh I love this, wonderful interpretation of the topic as well. This is the best. Your sketches always tell a lovely story. awww poor betty! and she’s so cute! Aaaaaaaaw! So cute and most people can definitely relate to it. I love your rendering and how the Elephant is the main character. Great stuff. Ah yes, the tempting red bikini. ha ha! You’ve done a lovely job with the fabric of the curtain. I love the way you’ve added just the spot of red. Great illo!! Great character Penelope! I love the line work and the concept! Great one!!! What a fantastic blog you have — such beautiful pencil illustrations of animals! This one is adorable: I love how bashful Betty is and the lovely red bikini. Oh my gosh do I love this!!!!!!!!!! !